What did jazz dancing look like in 1929? 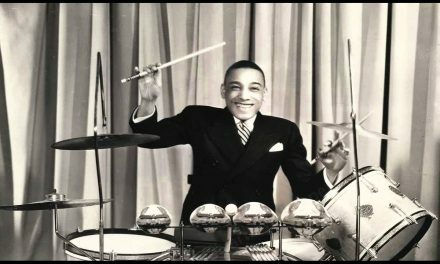 This early “talkie” featuring rare live footage of Chick Webb’s band shows us. Unfortunately, we don’t see much of Webb or hear him very clearly, but we sure hear his band. If Webb was born in 1905 – and there is some dispute about that – he would have been around 24 years old at the time of this footage was shot. Whatever year he was born, he was leading his own band in 1926 in Harlem. Two years after this footage was shot, his group became the house band at The Savoy Ballroom, the hottest of hot spots in Harlem. Yes, the master of ceremonies is a white man in blackface, a comic and jazz dance pioneer dancer named James Barton. Born in 1890, he was on stage at eight years old performing in vaudeville, minstrel shows and burlesque houses at a time when movies (still silent then) were a novelty. A glimpse of what popular entertainment was once like.